*Happy 4th of July. I purchased your book and I wanted to thank you for putting it together like you did. I was learning watercolor and my friend moved to Mesa Arizona and the other to Albuquerque so I am trying to figure out what to do on my own with the help of books. I love books and have over 130 Northlight books, but none of them tell me what f/stop to use when taking pictures and exactly what paint combination to use while painting. Thank you for your insight for the beginner. I saw three road workers sitting on a railing besides the road going into Trinidad, Co the other day. All of them had their back to me. One had a orange vest on, one a blue tee shirt and the third was leaning over and the small of his back was showing. If I had of stopped they would have turned around and I would not have remembered the way they were. I thought of your book when I saw them. Thanks again, Mitzi Ashcraft in the mountains of southern Colorado. I just wanted to tell you what an amazing book you put out. I received it last week (pre-order) and have not put it down! You are an amazing, gifted artist and I appreciate you sharing your knowledge with the rest of us. I have been attempting to paint with watercolors for several years now. And have bought, and read, many books on the subject. But none of the books seem to lead me step by step through everything I really need to know. Each demonstration has from 8 to 12 pictures of every painting, leading you gradually through the process, both in words and in pictures. This author tells you exactly how to paint beautifully in watercolors, and he does it in an outstanding manner. Each of the many demonstrations show you the original photograph, then they show you what to draw on your paper, and exactly what to paint. Dixon tells you what brush to use for each step, what colors to mix, exactly where to mask the paper, where to apply the paint, and where to darken it, and where to lift it. The range of subjects is outstanding, and exactly the sort of things I keep trying to paint myself (and some that I had given up trying to paint despite how much I love them). In particular, I love paintings of all races of children and elderly people, in normal everyday poses, and paintings of rocky landscapes. As a geologist, I have always been frustrated that I cannot portray beautiful sedimentary rocks both geologically correct (with horizontal layers as well as more vertical weathering pattern), and artistically pleasing. I nitpick every 'rocky' landscape painting I see in fact, because I generally spot some geological impossibility. The authors Grand Canyon painting, however, is beautifully done in all respects. The paintings of people filled my heart with joy, and there is an even larger variety of subjects, such as still lifes (glass and lace on a table), fruit, chairs and tables, a gorgeous fountain, a house, and much more. Ok, so I don't think he painted any flowers, but many watercolor books have nothing BUT flowers in them, so I for one don't really need that. The beginning of the book has a really nice section on what materials to use, and how to take a decent photograph for painting, including (YES) the fact that you don't have to be a 'slave' to the photo and copy every tiny thing (even if it distracts from the painting) as so many people tend to do. He explains how digital cameras and a photo processing program can truly enhance your artistic abilites. The main thing I love about this book is that he really teaches you what I have had a hard time grasping- how to really paint watercolor in layers, so that the color is building gradually and increasing in depth and beauty with each layer. I still try to do a 'paint by number' type of approach, and I can't thank the author enough for writing such an incredible book. I also love the fact that he gives you exact colors to mix, which really teaches you about color. I feel confidant now that I can pick up my watercolors again (instead of my opaque gouach which is easier for me) in order to keep striving for the unique beauty that is to be found in watercolors. *As a beginning watercolorist, I found this book to be most helpful for making bold colors that stand out. The photo information also helped me to "see" in a more discerning way. 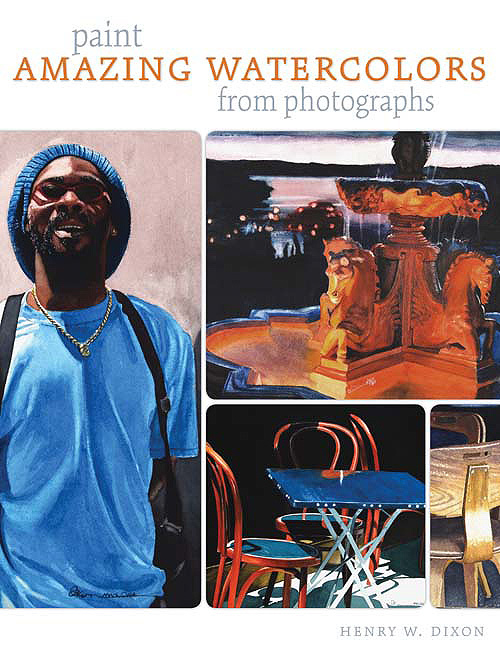 *This book is very informative as well as having amazing paintings and photographs. You think that you could be right there and pick up the object or walk into the painting because they look so real.